I was asked recently by a friend what we need or will need when our daughter comes home. Here are some things. 1. PRAYER! Right now you can be praying for her adjustment. She is just learning that she has a family and this is a totally new idea to her and she is anxious about it and all the changes that it means for her. Please pray for her to accept us and for her heart to be peaceful as she changes countries, homes and everything she has ever known. She does not realize what she doesn’t have and doesn’t see the need right now to change anything in her world. We know she will love having a family once she knows what that means, but right now she is just scared about it all. Please pray for her. Also, we need prayer. 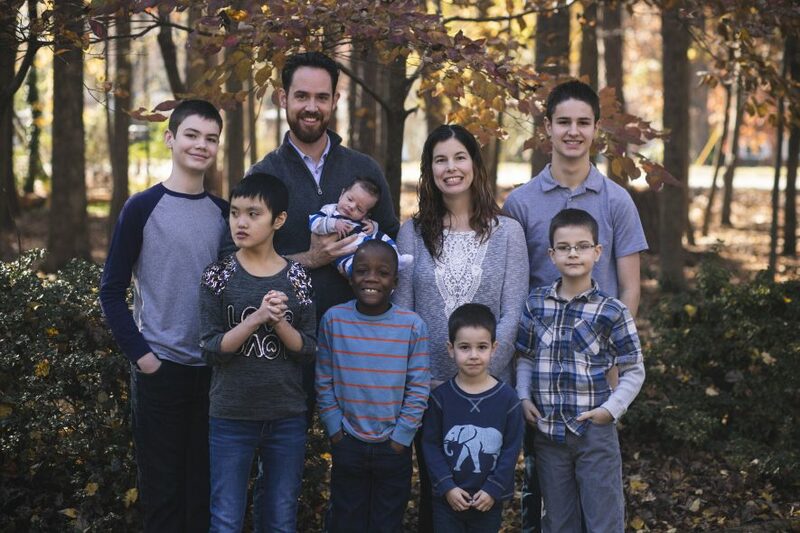 We need prayer as we transition from a family of 6 to a family of 7. Having a girl will change so many thing in our household. Please pray as we make preparations for her schooling, church and in our family. Please pray for us as she comes home that we will have patience to accept her as she is. The fact is that she most likely won’t like us all that much at first, and that is really hard as a parent to love a child who does not like you. Please pray for our hearts in this transition. Please pray for speedy paperwork and affordable plane tickets. God has all these details worked out and we are trusting in His timing and His plan. -Bring meals. Adoption is not different from birthing a child in that we will most likely be dealing with sleep issues and exhaustion for her and us as we all adjust to living together. Not having to cook for a while would be a blessing to us. But always call first and be sensitive to staying for long periods of time as she may not want to see new people. She tends to be very shy. -Send cards or call us. We would love to hear that our family and friends are praying for us and thinking of us as we make this transition. It is a difficult time as a family and we need your love to get through it. -Babysit our other kids. We will most likely have a million doctor’s visits to take her to once she gets home since she has special needs. It is really hard to take five kids to these doctor’s visits, so if you can babysit some of our kiddos as we do doctor’s visits, that would be really helpful. We will not leave her with anyone for the first 6 months or so so that she can bond properly with us. 3. Be accepting when you meet her. Elizabeth will be different from most children you have met in that she has some significant special needs. She will look different and act different and she will not speak English or understand you (much). Please be patient with her and us as we learn how to care for her. She may act out or have odd behaviors, please be patient. If you have kids, please prepare them for her by telling them she will be different so that they won’t be as nervous around her. We are finding out that she does understand more than even her care workers thought she did initially, so she may understand what you are saying, please be kind in what you say in front of her and treat her with respect. I know people will have a million questions about her, and her past and condition. We will answer some of those questions, but we may not answer them all out of respect for her and her story. So, please don’t take offense if you ask us a question and we politely refuse to answer. Adoption is about the child’s story and we have to respect her and her right to know about her story first before everyone else knows it. 4. Celebrate with us! We are planning to have a party for her after she comes home (hopefully for her birthday) so that everyone can meet her. This all depends on timing and how she is adjusting. We are thrilled to have a daughter and we are thrilled for everyone to meet her. Thank you so much for your love and support of us as we have traveled this journey. We are so excited to be reaching the end and we couldn’t have done it without all of you. Oh wow! This is so exciting and becoming so much more real, reading all these things. Way to go on knowing all those things. It all makes sense! As always, I will continue to pray. And please do not hesitate to let me know if there is anything I can do to make your life easier in the coming months of transition. H & I are very excited about meeting Elizabeth. I know H will embrace her as a sister as she embraces your boys as brothers and she will do so with gentleness and understanding. Love you guys!